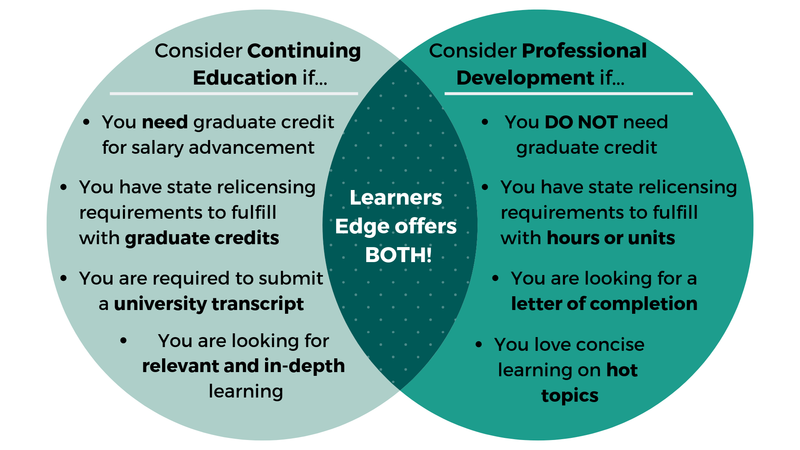 Below is a summary of how Learners Edge may help your continuing education and Florida teacher relicensing needs. This summary should in no way release individuals from their responsibility of ensuring that the course they take meets their professional needs. We hope it provides assistance in understanding how Learners Edge might help you in the accumulation of clock hours or graduate credit for salary advancement and the Florida teaching relicensure process. See the Florida Department of Education website for complete FL teacher relicensure information. Six (6) semester hours of college credit to include at least one (1) semester hour in teaching students with disabilities (SWD) must be earned during each renewal period to renew your certificate. See information below on Acceptable College Credit Equivalencies for Renewal, Appropriate Topics for Renewal Credit, and retaining all subjects on your certificate. Training related to the goals of the Florida K-20 System, such as: Content - English, economics, mathematics, science, social sciences, foreign languages, humanities, global economy, technology, ecology, first aid, health, or safety.